On January 20, the Financial Times reported that the European Central Bank (ECB) would start the process of hiring its new chief economist. At the top of the list, the article said, was Irish central bank governor Philip Lane. The article noted that Lane is popular among European diplomats and is a key ally of ECB president Mario Draghi. The only serious rival mentioned was Andreas Ittner, vice governor of the Austrian central bank. The fight that the Financial Times described is straightforward: Lane is a supporter of Draghi’s softer monetary policies and Quantitative Easing (QE) programs, while Ittner came up under the wing of Austrian governor Ewald Nowotny, a known hawk on all matters monetary. The Financial Times article clearly leaned toward Lane, whose softer policies are in line with the paper’s “reformist” editorial line. This is the sort of apolitical technocratic horse trading that the European elite and the financial press love: a tussle between Tweedledum and Tweedledee portrayed as an epic battle between progress and reaction. Viva la revolución! In reality, the differences in policy between the two contenders are little more than that between two shades of grey. Lane, for example, has recently been advocating that the Irish government run a fiscal surplus in order to prevent “repeating the costly experience of past episodes by which economic downturns were amplified by pro-cyclical fiscal austerity.” What Lane means is that the Irish government should “save” when times are good to ensure that they have enough “fiscal space” to accommodate budget deficits when a recession hits. This is the same old “government as household” analogy that poisoned debate in the wake of the 2008 crisis. 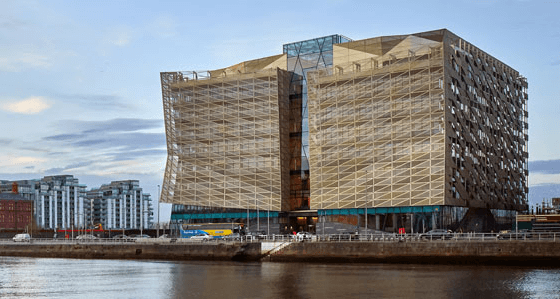 Moreover, Lane’s governorship at the Central Bank of Ireland (CBI) has been a disaster. Under his direction, the central bank has presided over a reflation of the Irish property bubble. What is more, key supporters of Lane are aware of this danger and are ignoring it. Stepping back a few paces, this shines a powerful light on the process of hiring and recruitment at the top levels of the European bureaucracy. In 2009, as the world watched, Anglo Irish Bank was nationalized. The scandal exposed a financial sector in Ireland that was rotten from the head down. Irish politics never really recovered and remains defined by these events. But the shenanigans at Anglo Irish were not the true cause of the crisis. The true cause was an enormous housing bubble that inflated between the late 1990s and 2007. The crushing austerity that was imposed by the EU during the deep recession was reckless and highly destructive, but in temporal terms, it was strictly a reactive measure. The domino that set this chain of events in motion was the housing bubble. Well, a reasonable person would be wrong. This is Europe, where up is down and down is up! 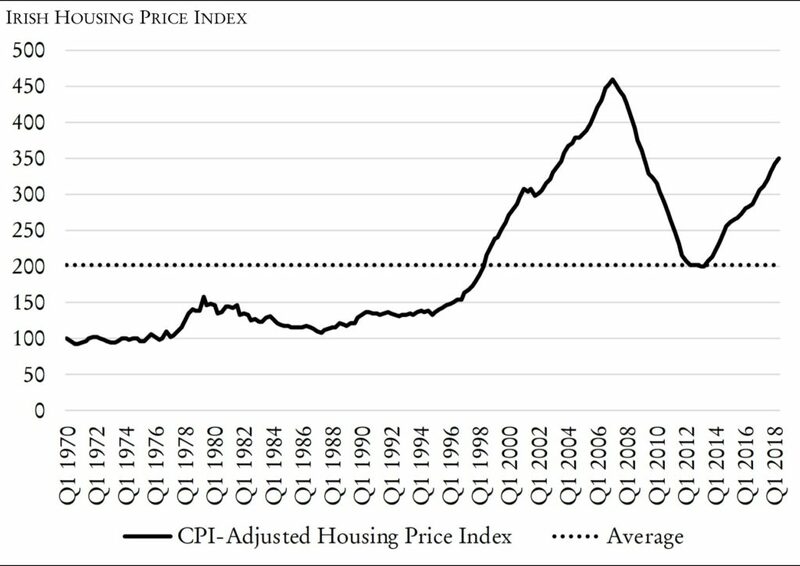 In fact, Lane’s CBI—the same one that labeled Ireland’s post-2008 property crash the worst in history—has overseen a massive rise in inflation-adjusted property prices. While real house prices have not yet climbed back to their 2007 peak, they are soaring far above average. On this valuation measure, the trough reached in 2012–13 was probably a stable equilibrium. Since then, however, the market has charged forward once more and housing appears to be overvalued by around 73 percent. The Irish housing bubble is back. What is so strange is that Lane’s supporters recognize the problem. Just last year, Mario Draghi himself said that the Irish market was “overstretched and vulnerable to repricing.” He highlighted warnings from the IMF, the OECD, and even the European Commission that the Irish market was back in a bubble. There is a slight difference between today’s bubble and the previous exuberance, however. While the previous bubble was fueled by bank credit, during this bubble bank credit growth has been tepid. Learning a lesson from the previous crisis, the CBI did tighten loan-to-income ratios to prevent runaway mortgage growth. But this is a classic example of fighting the last war. Housing prices have skyrocketed despite these policies because mortgage credit no longer appears to be doing the heavy lifting. Credit-fueled bubbles explode with more drama: banks fail, villains appear, politicians are shamed—and economists scuffle into the corner of the room and “rediscover Minsky.” But ultimately credit itself is a secondary factor in the formation of bubbles and the recessions that follow. Property bubbles arise mainly because of excesses in building and construction investment. During growth phases, capitalist economies rely on investment to keep chugging along. In a property bubble, much of this investment goes to building and construction. Builders see the rising house prices and figure that building more property will be highly profitable. But once the prices stop rising, these investments no longer look attractive, the building ceases, and the economy falls into recession. How deep that recession will be depends on how reliant overall investment growth was on construction investment during the bubble. 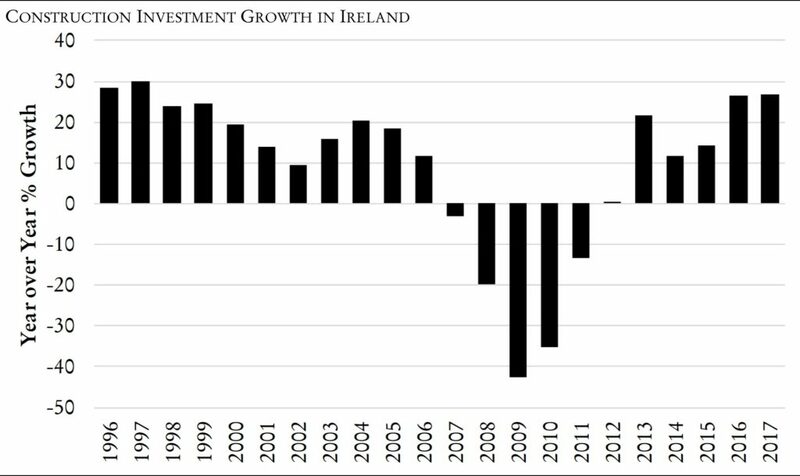 Irish construction investment growth is plotted in the chart below. At face value, it would appear that Irish construction investment growth was rising faster in 2016 and 2017 than at any time during the previous boom apart from 1996 and 1997. This would seem to be an ominous indicator. The only good news seems to be that construction investment today is less important for total investment in the Irish economy than it was in the past. Between 1995 and 2008, construction investment accounted for 52.5 percent of gross fixed capital formation, while between 2013 and 2017 it only accounted for around 23.8 percent. This would make construction investment only around 45 percent as important as it was in the last bubble. The simplest way to adjust the gross fixed capital formation figures for this accounting trick is to remove the R&D component for the whole series. When we do this, a less sanguine picture emerges. Between 1995 and 2008, construction investment accounted for around 57.5 percent of gross fixed capital formation, while between 2013 and 2017 it accounted for around 39.3 percent. This would mean that construction investment is about 68 percent as important to Irish economic growth as it was in the previous bubble. Roughly speaking, if construction investment growth is running at around the same rate as it did before the 2008 crisis, then the present bubble should be roughly two-thirds the size of the previous bubble. All this considered, the present property bubble is not quite as bad as the “worst property bubble in history,” but it is still very bad. Eventually property prices will take a knock in Ireland. This will probably happen when either the global economy slows or when yields on bonds rise to levels that cause investors to pull money out of the Irish property market. When this happens, it will no longer be profitable to continue building at the present rate. Construction investment growth will tank, and the Irish economy will fall into recession. Whenever the crash occurs, the European response to such developments is predictable. After all, it is written in the Maastricht Treaty. As tax revenues fall and unemployment claims rise in Ireland, the EU will call for austerity. It is difficult to overstate the loss of confidence that the Irish people will feel when this happens. They were told that the last round of boom and bust was a one-off event. They were also told that the whole thing was effectively the fault of a few rogue bankers at Anglo Irish. It was even hinted that these rogues had captured regulators and shifty Fianna Fáil politicians. None of this was true. And after the next crash, what people will see is that these problems are systemic—and the reason that they are ignored is because their entire elite, from the feckless Fianna Fáil farmer to the fresh-faced Fine Gael social justice warrior, are puppets in a larger system. As the Europeans extort the population into accepting austerity, and as unemployment climbs and youths migrate, the pitchforks will be sharpened and the effigies burned. Once again, let us take a step back and see if we can peek behind the curtain. Let us turn back to Philip Lane. If the situation is so volatile in Ireland, and if the key people in the European institutions are aware of the situation, then why are they considering hiring Philip Lane for an important role at the ECB? Consider Lane’s main achievement in the past few years. In 2016, Paul Krugman coined the term “Leprechaun economics” to highlight the fact that the Irish Central Statistics Office (CSO) was reporting that annual inflation-adjusted economic growth in Ireland in 2015 was 26 percent. Soon after this, the CSO set up a committee to investigate why the figure was so unrealistically high. Philip Lane was the chair. The committee eventually found what many suspected: multinational corporations were rebooking their earnings in Ireland to take advantage of the low tax rates. The committee then instructed the CSO to release a new modified GNI figure that would give a more realistic view of economic growth. Anyone who deals with these sorts of statistics can only welcome better data. Yet anyone who is actually serious about economic policy recognizes that at the end of the day Lane’s “achievement” was entirely superficial. It addressed foreign perceptions of the Irish economy rather than the actual chicanery at the heart of the Irish economy. Releasing the modified GNI figures did not actually do anything—it did not solve any problems. It was just a sort of virtue signal to international economists. But while Lane and the other Irish technocrats were placating the snide commentators in the international economics community with their new-fangled measurement, dangerous imbalances were developing in the Irish economy. These imbalances ultimately had an enormously detrimental impact on Ireland—and they are going to upend Irish politics once again. It seems worse than decadent that Irish policymakers are so focused on the water-cooler talk about leprechauns and statistical methodologies while yet another property bubble has been inflating in Ireland. Yet it is not hard to imagine that this is the sort of thing that these economists talk about at their conferences. “Hey Lane, have you fixed those ridiculous growth figures yet?” grins the boffin as he gets ready to tuck into another rubbery chicken breast at a largely irrelevant meeting in some European capital or other. Economists pleasing economists, using the tools of the economist. Hiring in these suffocating little circles is not meritocratic in any normal sense of the term. The EU institutions hire people simply because they speak the same bland, irrelevant, technocratic language that they do. They do not want someone who would highlight, say, that the current European growth model seems to favor a perpetual cycle of chaos in the Irish property market. Rather, they want someone who will kvetch about bad statistics without doing anything to change the underlying realities. The worse the problems become in the European economic system, the more weight is put on statistical questions and Krugman’s bad jokes. These institutions especially want to ensure that every technocrat in the EU aspires to a position in an EU institution. They want every Irish technocrat to dream of being a chief economist at the ECB or something similar. By setting up the cursus honorum in this way, they maintain allegiance to their overarching project—one that seems to be otherwise failing. The technocrats that are supposed to be working in the interests of their own countries will instead look outward and identify mainly with the goals of the EU. This allegiance is cultivated from an early age. In university, many of these technocrats will have received funding from an EU-financed grant scheme that will send them on a study abroad program where they will make friends with technocrats from other countries. Typically, they will see this as a cosmopolitan experience, much in the same way as old colonial administrators did when they met their counterparts from the colonizing country. But what is really going on is that they are being groomed to identify first with the broader technocratic EU project and only secondarily with the interests of their own country. When they gain charge of key institutions in their own country, they will already have learned not to ask awkward questions that might undermine the foundations of the highly dysfunctional EU system. In the end, it does not really matter if Philip Lane becomes chief economist at the ECB. If he gets the job over Ittner, the central bank might go a little easier on a country like Ireland when crisis hits, by buying up a few extra bonds and driving borrowing costs down a few basis points. In the broader scheme of things, however, none of this will matter much. The housing bubble that Lane has presided over, with the full knowledge of his superiors, will be his real legacy and the real driving force in Irish politics in the coming years. We should, therefore, strive to tear off the mask and look at the broader forces at work that are causing such extreme dysfunction in the EU. The heart of the problem is not QE, or Anglo Irish, or even austerity. The heart of the problem is the EU itself. 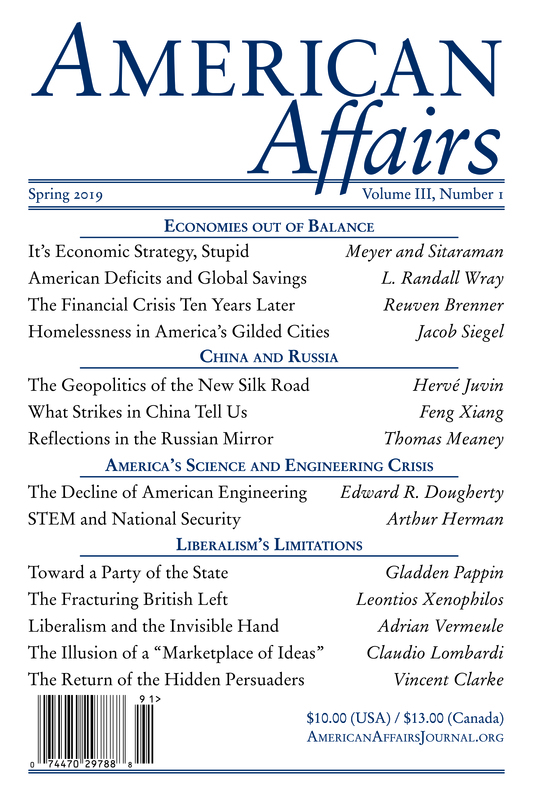 This article is an American Affairs online exclusive, published February 6, 2019.